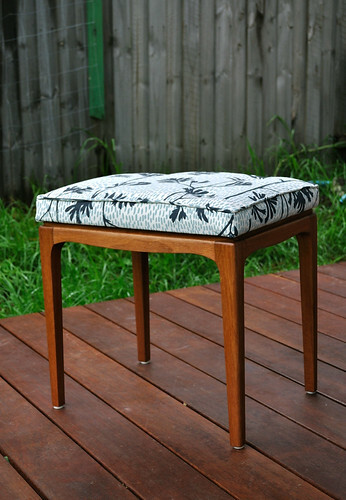 i finally finished the revamp of the parket foot stool that i picked up on ebay. 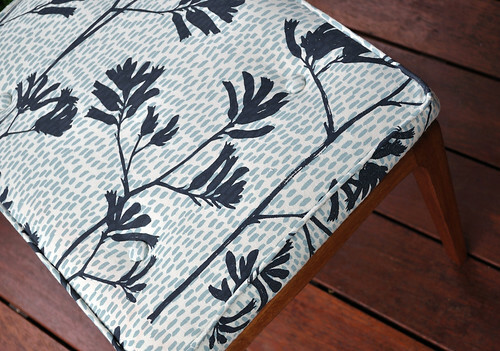 i sanded off all the old varnish, gave it a nice new satin coat and reupholstered the cushion in my very favourite ink & spindle print, kangaroo paw (this colourway seems to be sold out now. super happy i nabbed it while i could!). this was my first time using self covered buttons and piping but both were easy peasy and really make the job, i think. i scotchguarded the cushion to help protect it against sticky fingers and spills but i'm still pretty pleased that neither kid has shown any interest in it. yet. wow it looks amazing! The piping makes it look so professional - v. impressed! It looks awesome! Love I&S. it look fantastic! I am mustering up the courage to reupholster our rather ancient lounge suite. It has the button detail too that I love. Thanks for the inspiration! Fantastic - great fabric - think it is what my sister just made cushions from. Ooh! Looks LOVELY! Nice one! What an incredible make over- I love it! OMG Leslie that looks gorgeous! You did an awesome job, nice work with the piping too! Your talents never cease to surprise! Gosh you are so nifty! I must try harder to get things done! Love it! I have one of these as part of my dressing table set. Great stools. Wow - the stool looks amazing. I love the fabric. 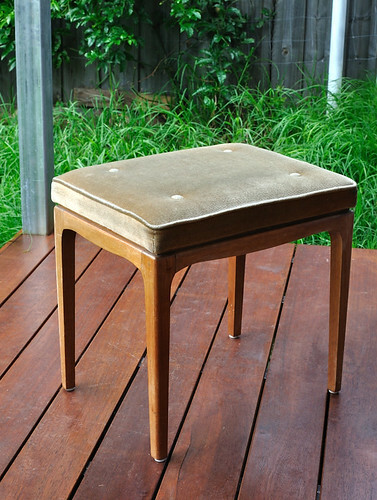 What a gorgeous stool! I was just wondering what satin coat you used? I have an armchair I'm working on that needs similar treatment.